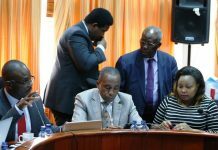 In less than a month, 19.6 million Kenyan voters will go to the polls to elect their president and a motley pack of other office-holders, including members of county assemblies, MPs, senators and governors. In the presidential race, voters will either give the incumbent, Uhuru Kenyatta, a new lease of five years in State House, or elect Raila Odinga as Kenya’s fifth president. Even though close to eight candidates will be on the presidential ballot, the race for State House is essentially between Uhuru and Raila, a former prime minister. 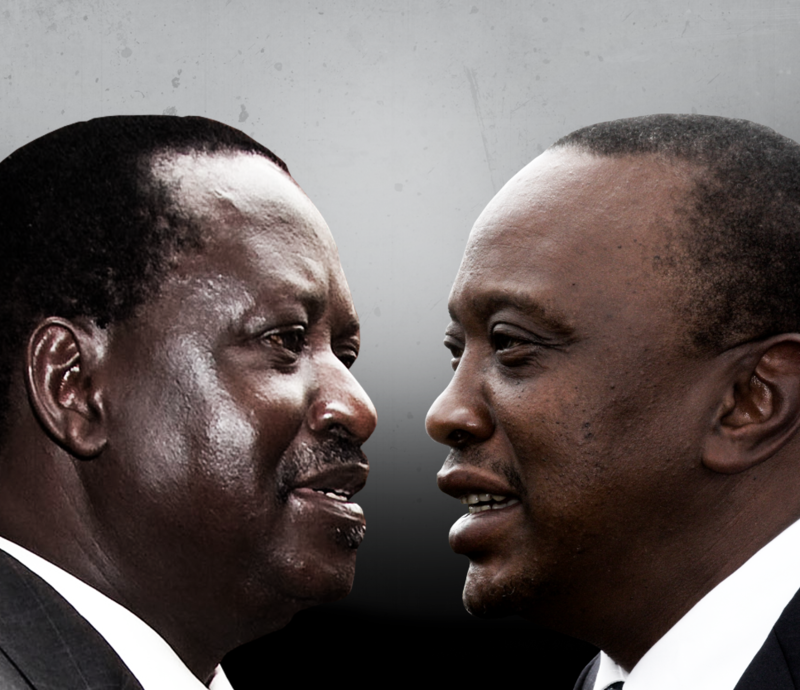 This is a rematch, the two having faced each other in the 2013, where Uhuru Kenyatta won with 6,174,433 votes, beating Raila who got 5,340,546 votes. The latter disputed that result on allegations of rigging and unsuccessfully challenged Uhuru’s election at the Supreme Court. So much water has passed under that bridge now; so much has changed. Whereas Raila is at his political best when fighting as an outsider, Uhuru is weighed down and buoyed by incumbency all at once. So, who has the upper the hand in this gladiatorial contest, and what are the stakes for the two candidates? Will Kenya elect its first Luo president or will the Kenyatta dynasty, once and for all, consign Raila and by extension the Odinga dynasty to political oblivion? Is this Raila’s best chance, and is Uhuru too damaged by inefficiency, an incompetent administration with a dismal record, and unparalleled corruption and tribalism, or does the contest between Uhuru and Raila simply depend on who between the two has the largest coalition of tribes on his side? One factor, we must not lose sight of is that Uhuru is much stronger than has been made by the national narrative so far. In the same breath, Nasa isn’t the political behemoth that it has been painted to. The race is well balanced and is very close. The margins are small, and the slightest shifts in vote patterns will determine the winner. 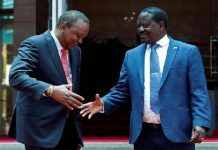 Uhuru and Raila are no strangers to Kenyans, and to each other. This election is about well-known candidates who have been on the political scene for decades. Each of the candidates has known strengths and demonstrable weaknesses. Kenyans have made up their minds and come August 8th, as they troop to the polling stations, there will be few who will have doubts as to their preferred candidates. Thus, the choice between the candidates is not hinged on fresh narratives or new ideas from the two. Rather, the choices are made on the history and rivalry between the two, and where a given voter stands on that. 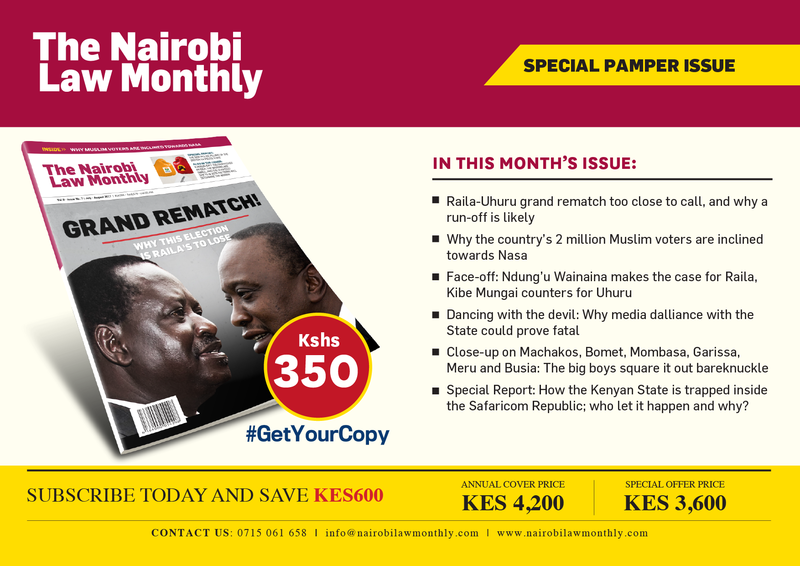 For Uhuru, incumbency is a double-edged sword. On the one hand, it gives him control and leverage over instruments of the State, like the police, the army and the entire government bureaucracy during the electioneering process. In African elections, this counts for a lot. This, in a way, undoubtedly gives him an advantage in that the entire State resources are at his disposal during his campaigns. The other side of the sword, which could be sharper, is that he has a record of five years that he must be judged against. Kenyans are asking themselves whether they are better off now than they were five years ago. People are asking what Uhuru’s record is in the fight against corruption, and whether or not he has led the most tribal administration in the history of the country. Kenyans are asking whether Uhuru’s administration is second only to The Philippines’ Rodrigo Duterte in terms of the wanton extrajudicial killings that have become a defining feature of his administration in the past five years. These are some of the questions that will eat at in the minds of Kenyans as they decide between the two candidates. So, what other factors are in play? Tribe and coalition of tribes is always the most determinant factor in Kenya’s presidential elections. Uhuru and Raila are neck and neck on the race to State House because their two respective tribes have dominated Kenya’s politics since independence. Their respective dominance is principally premised on their numerical ethnic strength. Forget the other narrative on “what this election will turn on”; those are all secondary factors. Issues such as agenda (as articulated in manifestos), character, integrity and vision of a candidate decide nothing and count for little. The primary factor in this election is the ethnic strength of the two candidates, and the broader ethnic coalitions of the two. Uhuru has the Gema bloc and the Kalenjin on his side. These are formidable ethnic groupings, and solid ones at that. The Gema communities have 10 counties comprising Kiambu (1,180,920), Meru (702,480), Tharaka Nithi (213,154), Nyeri (456,949) Kirinyaga (349,836), Nyandrua (335,634), Murang’a (587,126), Embu (309,468) and Laikipia (246,487); Nakuru (949,618), by extension, belongs here too. The total Gema vote is a staggering 5,331,672. The Kalenjin vote is in the seven counties of Kericho (375,668), Uasin Gishu (450,055), Nandi (346,007), Bomet (322,012), Baringo (232,258), West Pokot (180,232) and Elgeyo Marakwet (180,664). They add up to 2,086,896 votes. Even though the counties in the Gema bloc – in the context of the upcoming election – make up the given number, 5,331,672, this figure needs some qualification and pruning. A number of counties where the Gema community is the predominant grouping, are actually ethnically cosmopolitan or have other dominant communities. This figure needs to be thus rationalised as it relates to the following counties. 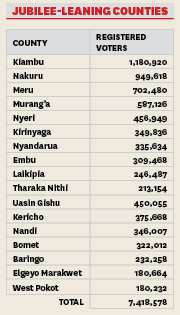 First, Nakuru has substantial Kalenjin, Kisii, Luo and Luhya numbers. In fact, Gema members in Nakuru County may constitute between 50 to 60% of the votes. This matrix is complicated by the fact that Nasa is supporting a Kalenjin candidate for governorship of the county; as well, a strong Nasa coalition exists to counter the Gema vote. Taking this into consideration means that 300,000 – 400,000 of the Nakuru vote may go to Nasa. Next, Kiambu’s vote also needs moderating and readjusting. Being a county that neighbours the capital, Nairobi, the county has a large number of other communities especially in Kikuyu and Thika towns. On this premise, Uhuru shouldn’t count on at least 10 or 20% of the Kiambu vote. As well, Laikipia County has strong pastoralist communities in the Samburu and Maasai. These communities, owing to a number of factors discussed elsewhere in this section, are strong Nasa supporters. Finally, whereas, Uhuru is almost assured of a 100% vote of the Kikuyu and Embu communities, the same cannot be said of the Meru. Uhuru’s re-election agenda within the Meru community has been greatly compromised by a number of self-inflicted wounds. For one, the rivalry between Governor Peter Munya and Senator Kiraitu Murungi has played against the President’s interests. Governor Munya is running on PNU ticket, while Senator Murungi is on Jubilee. Two, Munya has declared that he will run for the president in 2022 and his community sees his bid as the best and most credible chance for a member for the community to ascend to the highest office in the country. His main rival in 2022, as far as is reasonably foreseeable, will deputy president William Ruto. Again, this fundamentally plays against Uhuru. By conjoining the 2017 election with that of 2022, the Ameru see Uhuru’s explicit endorsement of his deputy as a slap in the their face. According to the Meru voters, that direct rebuking of their aspirations will have consequences for Uhuru in 2017. Lastly, the Meru, for the first time, are showing signs of political independence from their neighbours in Central Kenya. 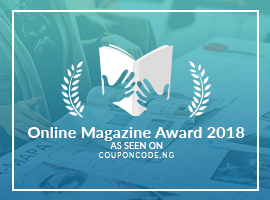 According to some members of the community, they haven’t only been taken for granted for long, but also their default mode has been to blindly support every candidate from the region. This, coupled with Uhuru’s poor record in terms of development in the region, makes Nasa viable among the Meru. If Nasa makes a breakthrough in the Meru votes and gets a modest, let’s say 20% of the vote, then Uhuru’s chances for re-election will take a huge hit. Amongst the Kalenjin’s 2,086,896 votes, two issues are worthy of attention. First, the effect of Governor Ruto of Bomet and his party’s reach in South Rift is unknown but could be critical. If Ruto takes 10 to 20% of the Kalenjin votes – which is a mere 200,000 – to Nasa, then Uhuru’s chance for re-election is will be greatly compromised. Second, we need to factor the cosmopolitan nature of certain counties, like Kericho and Uasin Gishu, which have voters from Western and Nyanza. Lastly, the Pokot vote is dicey and unsettled. Being a proud and independent community, the direction the community will take is undetermined. As for the Nasa coalition of tribes, the numbers are as follow: The Luo community has four counties – Kisumu, (539,210), Siaya (457,933), Homa Bay (476,875) and Migori, (388,633). The total registered voters in Luo-Nyanza are about 1,862,651. The Luhya votes are concentrated in the following five counties: Kakamega (743,736), Bungoma (559,850), Busia (351,048), Trans Nzoia (339,622) and Vihiga (272,409), with a total vote of 2,266,665. The only qualification relates to Trans Nzoia, which has an ethnic mix, and where Jubilee could get some play. Kambaland have three counties: Machakos (620,254), Kitui (474,512) and Makueni (423,310), Kitui making a total of 1,518,076. So, the five ethnic groups that are on either side of the contest dominate 29 counties of the country. That leaves 18 counties to fight for votes (the so-called swing/battleground regions). 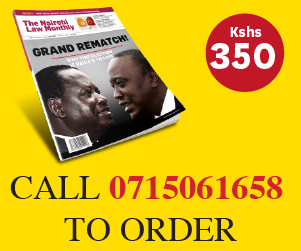 Until this point, Nasa has 5,647,392 and Jubilee 7,418,568, and with an advantage of 1,771,176 votes – keeping in mind this number reduces significantly owing factors such as cosmopolitanism and dissent as discussed above. Uhuru has the advantage here, which gives him a huge head start as he hunts in other communities. So as the two candidates seek votes in 18 counties where their five tribes are not dominant, Raila kicks the vote hunt with a deficit of about 800,000 votes disadvantage in terms of their respective coalitions’ ethnic bases, which he must recover massive from the rest of the country. Let us now see how the rest of the country plays out between the two. From the onset, his disadvantage is mitigated by the rationalisation of votes in the counties of Nakuru, Kiambu, Laikipia, and, to some extent, Meru and the South Rift. If this proves correct, then Uhuru’s advantage going to ethnically neutral tribes will be about 800,000 votes. Further, if Governor Ruto of Bomet becomes a player in the Rift valley vote, any gains he makes for Nasa will further erode the advantage Uhuru has in that permutation. These ethnic votes, apart from the massive numbers they give their respective candidates, are important on a number of other grounds. Their loyalty is tribal and since their choice is not rationally driven, they constitute a solid voting block. Further, they usually don’t suffer from voter apathy. They have an aversion for competing ethnic groups, which is their driving force; the fear of ethnic dominance pushes them to vote religiously. These five ethnic communities highlighted thus far, which dominate the 29 counties, have a total vote of 13,065,960. The rest of 18 counties have about six million votes, and it is these counties that will decide the winner between Uhuru and Raila. These 18 counties are, for the purposes of our analysis, further divided into two categories. The first category is those counties that both candidates are equally matched and will have little effect on the total votes in the country. These are Isiolo (75,642) Samburu (82,787), Marsabit (141,708), Wajir (162,902) Garissa (163,350), Mandera (175,642), Turkana (191,435), Lamu (69,776), and Tana River (118,327), with a total vote of 1,181,569. 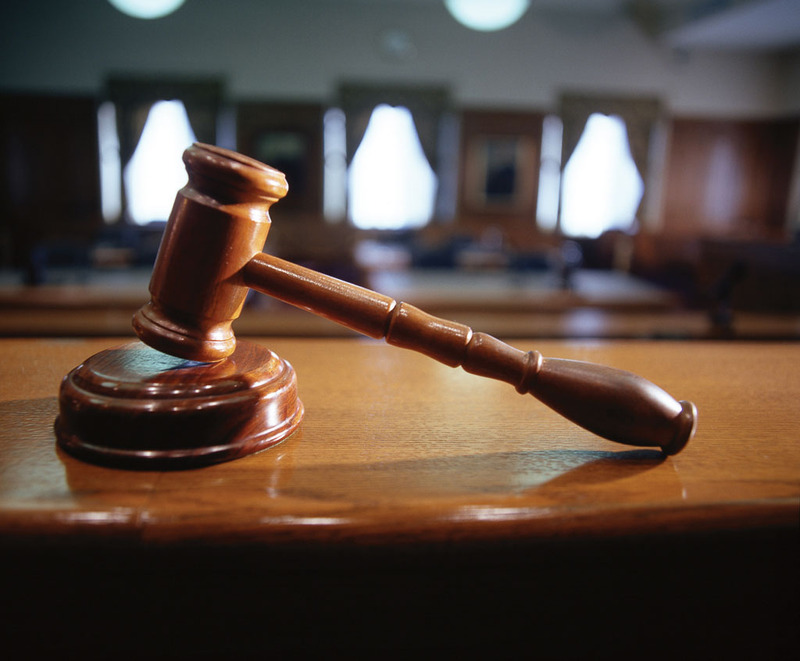 This leaves a second group of eight counties that will effectively determine who will be elected President. Mombasa (580,223), Kilifi (508,068), Kwale (281,041) and Taita Taveta (155,716). These four coastal counties have a total vote of 1,525,048. The two counties of the Kisii community are also critical. Kisii has (546,580), while Nyamira has (278,853), making a total vote 825,433 votes. Then there are the two Maasai counties of Narok and Kajiado. The former has 341,730 and the later 411,193, making a total of 752,923. These counties have sizable Kikuyu populations, and that counts in a tight race. Still, the votes tilt 60:40 – or 65:35 – in favour of Raila. Finally, we have Nairobi, with a total vote of 2,250,853, as a standalone county. The dynamics in Nairobi are both dicey and interesting, and even though Raila has a slight advantage (60:40), the difference is too negligible to play any decisive role. Nairobi is thus counted as a non-factor, just like the pastoralists counties of the country’s North. The 18 counties will be influenced by local factors too. For the coastal counties, two important factors are at play. First, many voters are convinced that Uhuru’s wars with the Governor of Mombasa Hassan Joho will cost him very dear. Many see Uhuru’s quarrels as very un-presidential. This, coupled with the closure of businesses owned by Joho’s family, eroded the confidence many voters had in Uhuru. Second, the Coast has been hit hard economically in the past five years. Tourism has collapsed and the new railway line is seen as a scheme to shift the economy of the port city to Naivasha. North Eastern voters, despite the misery of neglect, extrajudicial killings, poor infrastructure and low education standards, will vote evenly between the two candidates. In the entire North, the expectation is that both candidates will score evenly. It must not be lost that there is schism between the political class and the average voter in Northern Kenya. Whereas the youth will disproportionately vote for Raila, Uhuru is liked among the elders, clan prefects and the political class. The voting pattern in Wajir and Mandera will be influenced by a clan scheme to trade favours with Jubilee brokers headed by former cabinet minister Mohamed Elmi. Elmi, one of the most uninspiring cabinet ministers in Kenya’s history, has been the point man of the Jubilee government amongst his clansmen in Wajir and Mandera. He has been tirelessly negotiating with Jubilee to award a number of board directorships in parastatals in case Uhuru wins a second term. 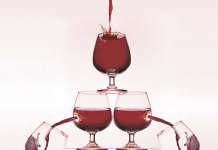 Why board directorships in state corporations should be a priority in a region that is at bottom of every index of development points to the priorities of the political leaders in the North. The two Maasai counties are fairly cosmopolitan. Kajiado has strong migrant communities who lean heavily in favour of Jubilee, while the ethnic Masaai favour Nasa. Land issues and a feeling of exclusion and marginalisation are important factors in play. Narok has similar factors in play. 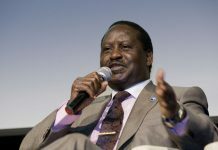 The general feeling is that Raila has the one who has shown interest in fighting for their land and pastoralist rights. 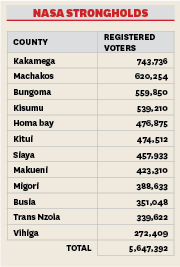 The four coastal counties and the two Kisii counties have a combined vote of 2,350,481. It is these six counties that will determine the fifth president of Kenya. These counties overwhelmingly voted for Raila in the 2013 election to the ratio of 80:20, and keen observers are of the view that the fortunes of Uhuru in them have not improved one bit. If Raila can neutralise Uhuru’s advantage in the 29 counties that are dominated by the “big five” that are of the either side of the Nasa-Jubilee divide and come out of that contest even with Uhuru, then he is Kenya’s next president. On the other hand, for Uhuru not to loose ground in the remaining 18 counties, he must enter that fight with a solid number from the Gema and Kalenjin blocs and remain competitive in the other 18. Taking this as an important signpost, anything less than a one million surplus from the 29 counties will be a proper disaster for the president. After the tribal factors, we need to interrogate what factors will influence the 18 counties in the battle for their six millions votes. Since it is here that the election will be lost or won, we must appreciate why these counties will vote for either Uhuru or Raila. So, whereas Uhuru has an advantage in the tribal arithmetic in the 29 counties, when it comes to the 17 counties that don’t necessarily have an ethnic interest in the contest, he performs dismally. These votes are what we call the rational voters who are not swayed by an ethnic pull, as they don’t have a candidate from their respective ethic groups. These counties interrogate the candidate on objective, verifiable facts. Principally, Uhuru underperforms in the remaining 18 counties because he is weak on issues, and struggles to convince any voter who is not influenced by tribal considerations. Uhuru, despite the opportunities he has had, has failed to deliver on his promises, and exacerbated an already bad situation. Consider the cancer of corruption that has spread rapidly to the body politic of the country. Despite his anger and occasional rage, many Kenyans see the same as stage-managed for the peoples’ consumption. Kenyans have come to accept that Uhuru will never fight corruption. The economy, despite a steady growth rate, according to the World Bank and the IMF, has been a disaster for the common man. Prices of goods have skyrocketed and essential food items have become scarce. The local economies of many Kenyans have collapsed. His disdain for devolution – and a general feeling that Uhuru doesn’t like checks and balances, especially by the Judiciary – has been noted across the board. As a politician who has not been that enthusiastic about reforms and constitutional limits to presidential powers, Uhuru comes out as a president who yearns for the old order. His dislike for the Judiciary, particularly during the tenure of retired Chief Justice Dr Willy Mutunga, demonstrated clearly his impatience with the rule of law. Taking all factors into consideration, the race between Uhuru and Raila is too close to call. The margins are too narrow and it may turn in either direction, depending on, among others, voter turnout. Considering how close it is, a rerun cannot be ruled out. There are two unknowns in this election. First, rigging is a common occurrence in Kenya. The extent of and how widespread it will be in Nyanza, Rift Valley and Central regions is unknown. Second, how many dead voters are on the register? Whether they wake up from their graves is another critical factor. It is the ghosts of dead voters that influence elections in Kenya. If they keep their peace and remain in the graves, Kenya will see a paradigm shift in politics.